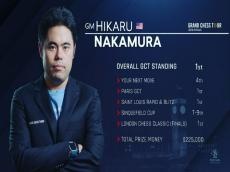 Hikaru Nakamura won the 2018 Grand Chess Tour and its $120,000 first prize after beating Maxime Vachier-Lagrave in the fourth blitz game of the final at the London Chess Classic, according to Chess.com. Fabiano Caruana came in third as he defeated Levon Aronian in their match. Gawain Jones won the British Knockout.